Hello friends! Oh what a hectic weekend it has been for me and hubby! Right after we got home from CHA we had to pack once again for a trip to Ukraine. Transatlantic travel during snowy winter is no easy thing and somehow we always have the most eventful experience to say the least. I love to travel, but being stuck in an airport for extra 24 hours is just not fun at all. 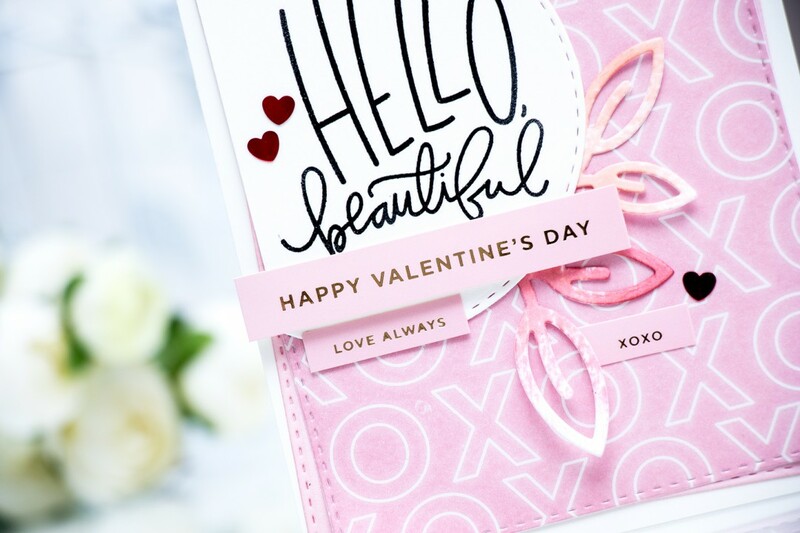 Anyhow, we are finally back home in Ukraine and I am oh so super excited to share a Valentine’s Day card and video tutorial today! I used Simon’s February Card Kit plus a few of my favorite dies to create this this project. I started by picking out the dies I wanted to use and went with Stitched Rectangles and Circles as well as Leaves from the Single Roses die set. 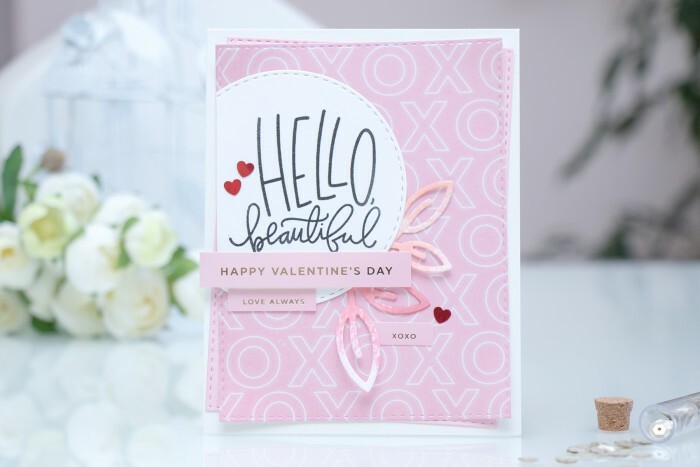 I used VersaFine Onyx Black ink and clear embossing powder to heat emboss the Hello Beautiful sentiment onto the circle die cut. I prefer stamping the image in black and using clear powder rather than black as that helps me keep things nice and clean. 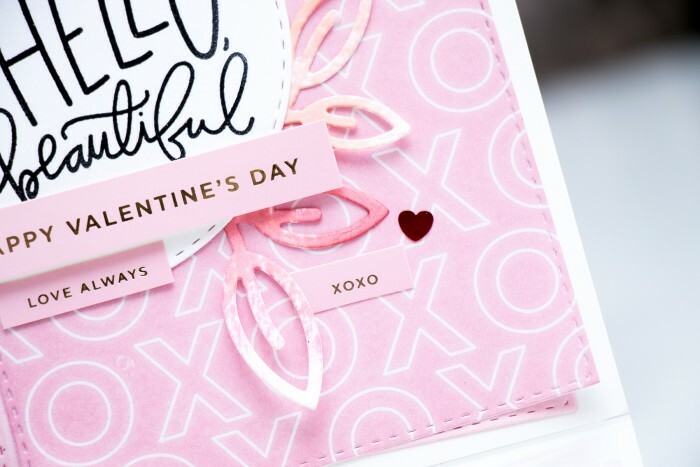 I also added a gorgeous Happy Valentine’s Day light pink sticker using foam adhesive on top. I used 3 colors of ink from Simon – Rosie Cheeks, Twirling Tutu and Hollyhock and direct to paper technique to color white cardstock and die cut the leaves. I really like how uneven and fun the ink looks on those die cuts, very unusual and unique, I think I’ll be using this direct to paper technique more in the future. I also added several additional sentiment stickers from the sticker sheet from my February kit and adhered a few red sequin hearts to finish this project. PS: Hope you got back okay and were able to get a bit of rest! I love it Yana!!!!! Simple and beautiful. 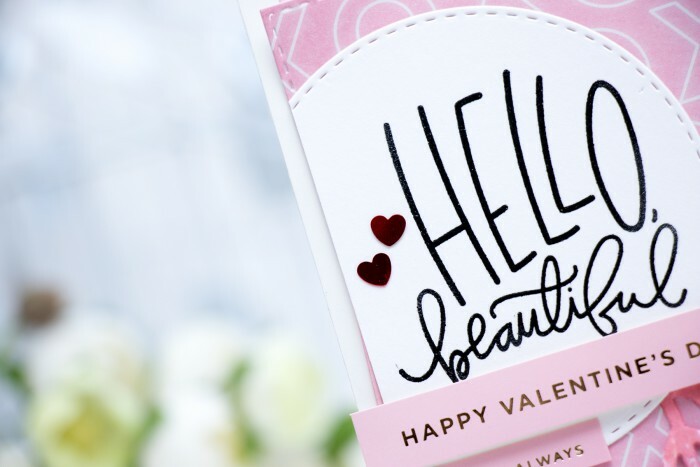 You are truly amazing and this card is delightful! This is beautiful Yana. I love the gold embossed sentiment stickers. Beautiful card, thanks for the video! thank you, Melissa! glad you enjoyed it! Such a pretty Valentine. I especially like the layers you create. One can never have too many layers and then distress them as you see fit. Not being a big fan of traditional Valentine color scheme (it can be too cheesy and tasteless) I’m amazed by this card! It’s so stylish and IS tasteful!